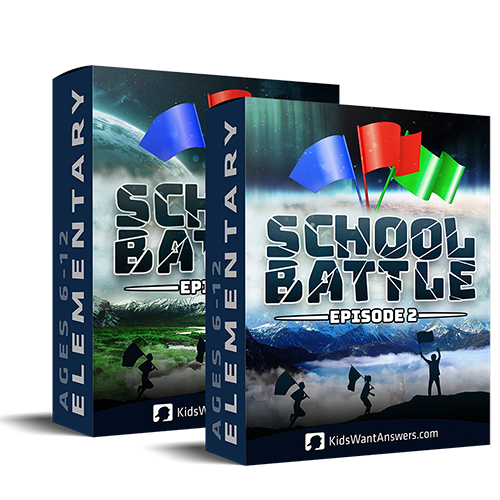 Enjoy a steep discount with the School Battle 1 and 2 bundle. Watch how your regular kids/students will eagerly invite their friends to compete in each of these two-week competitions, filled with twists, turns and a deeper meaning. The School Battle series are easy to use at your regular service times, but can also be used as separate outreach events at any time of the year. It’s loved by both youth- and children’s ministries around the world (Age 7-15). Outreach programs have never been this exciting! With each School Battle series, you’ll temporarily replace your regular service with a two-week competition where kids from neighboring schools “battle” in hilarious and awesome competitions. Your room will turn into an arena. Kids will be dressed in their school’s colors; and leaders will become team mascots! In order to win, kids are encouraged to invite friends from their school. Together, they’ll experience the event of a lifetime: School Battle! For an overview of SchoolBattle 1, click here. For an overview of SchoolBattle 2, click here.